When operating, a heat sink (not show) must be applied to the processor. A friend of mine, Mike S. in Michigan, USA has sent me a new SBC (Single Board Computer) with which to play. It is a super-set clone of the Rapberry Pi (RPi) design. The board layout, size and basic design are equal. But it has much more of everything else. 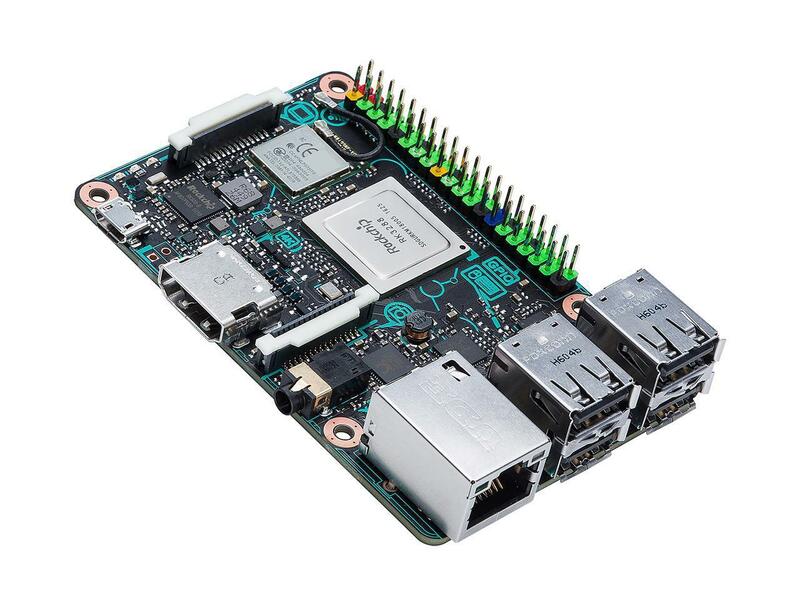 The SBC is called the Asus Tinker Board S. I will refer to it as the ATB-S. Sometimes just leave off the Asus A (TB-S). The technical specifications are impressive. The processor High speed operates at 1.8GHz rather than 1.4GHz and has four cores like the RPi. Also 2GB of LPDDR3 dual channel memory rather than the 1GB of the Rpi.. A big addition is 16GB of onboard eMMC (not available on the Rpi) and an SD 3.0 interface, the place for a micro SD card – same as the Rpi. All this comes at a price of course, making the ~$61.00 ATB-S, 1.74 times more expensive than the ~$35.00 Rpi. Not too extreme when considering the improved specifications. What might be deduced here is how hard it could be for the Raspberry Pi to hold it’s long standing price point in its next revision. As I said, the ATB-S has been gifted to me. Would I purchase the ATB-S given the choice with the RPi? I think it would depend on the application. In an applications where long term dedicated use, like a file server is intended., the answer is probably yes. For non critical use like learning programming and developing code, the lower cost, lower speed RPi is certainly adequate at a lower price. Is the ATB-S a Pie eater? Ha! Certainly not where the higher price is an important factor. The niche for the RPi is its low cost low, but reasonable performance. Driving cost higher could take it out of the niche. Asus may be exploring where that upper edge price boundary lies. 1 comment to A Pie Eater? The Asus Tinker Board (ATB) is a very nice piece of SBC (Single Board Computer). For hardware, it has “all the right stuff.” But for my taste, The default software OS is a POS (Piece Of Ship) uh… yeah, that’s the acronym term. That would not be everyone’s opinion. It’s mine. That goofy looking logo face is bad enough just by itself. I want to use the ATB-S as an Internet computer. That’s why I am a bit harsh on the original ATB OS. I want more of a PC feel and software. Armbian can be configured for whatever the user needs. The best take from all this is there is no one “right way” to configure a SBC computer. The owner can do whatever gets the job accomplished. I will be doing a lot more configuring and trying out of software. I haven’t decided what application to dedicate one of my boards to do. I really just like playing with the without much purpose. I have some far of thoughts of creating some sort of lighting display. I have several Light-O-Rama control boards and computers I used in the past for outdoor Christmas lighting sequenced to music. I am thinking of a smaller indoor version. I know its been done but not by me. That’s Pi in the sky (pun intended) and definitely not an immediate goal. That’s where I will leave things for now. There will certainly be more to come on this topic.